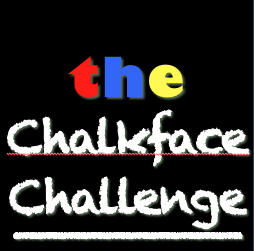 There were 29 entries for the Chalkface Challenge 2014 - the only writing competition judged entirely by children*. This year two schools took part in the judging and reviewing process. 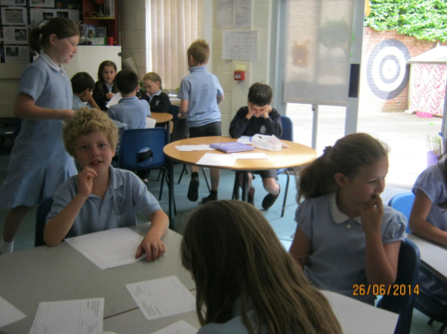 The judges were year 3 and 4 children from Sparsholt C of E Primary School, Sparsholt, Hampshire. 10 and 11 year old children from Chew Stoke Church School near Bristol reviewed the results. 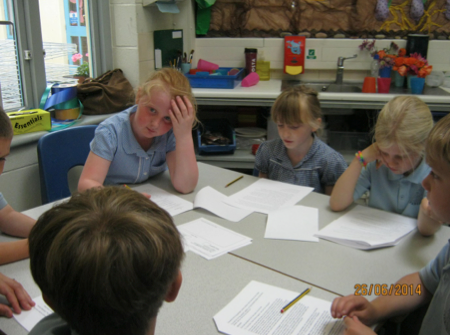 The children, supported by their teachers, Lorraine Cooke at Sparsholt and Kirstin Simmonds at Chew Stoke excelled themselves with their conscientious judging, reading and enthusiasm for new stories. Thank you! Before I announce the winner, here are the excellent reviewers of Chew Stoke who were asked what they liked, what they didn't like and if there was anything they'd change. After three rounds of intense judging, the children in Years 3 and 4 at Sparsholt Primary School have chosen a winner. But before we reveal which one it is, here are some thoughts on how the children saw the process. 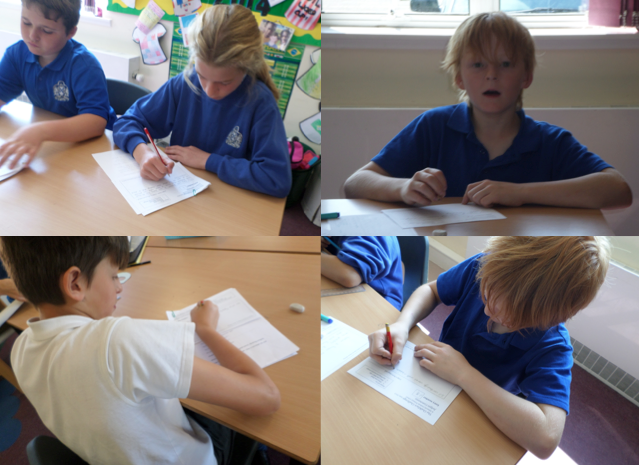 They all took their role very seriously, reading, recording their thoughts and swapping within their group during the first round to come up with a top ten – 2 per group. This generally wasn’t too hard with some stories having clear appeal for the target audience while others missed out because they took too long to get into the action or the children thought that the stories were pitched at older children. A shortlisting panel of Year 4 children reduced the top 10 to the five best entries, then all five extracts were read to all of the children and they voted individually. Voting was close and there were slight differences of opinion between the two year groups, but the winner was equally popular with both 7-8 year-olds and 8-9 year-olds. There are four runners up whose opening excepts were sent with Jill's to the shadow judges. Look in next Sunday for these authors, their comments from the children and the shadow judges' deliberations. Deep down in the deepest, darkest cave, Elrac tiptoed towards the glowing cauldron and peered over the edge. His eyes opened wide. The liquid was bubbling like lava from a volcano. He felt excitement bubbling up inside him, too. Reaching out, he gripped the stirring stick and began to swirl the mixture around. “Boy!” Suddenly, a voice echoed round the cave. Elrac jumped and dropped the stirring stick, almost tipping himself into the hot, spluttering liquid. Spinning round, he peered up into a pair of piercing yellow eyes. It was his master, Wizzbang. Elrac licked his dry lips. He wanted so much to please his master and to pass the test. How he longed to be a real wizard! Elrac opened his mouth, but no words would come out. “N-no sir, I mean y-yes, sir.” Elrac had been trying to forget all the experiments that had gone wrong. Elrac knew why. The potion was for getting rid of ten enormous boils on Wozznip’s bottom! Elrac gasped. He’d forgotten the most important ingredient - the crushed, dried leaves of the Konkipong tree. Dashing to the shelf at the side of the cave, he grabbed the jar labelled ‘Crushed Konkipong Leaves’. At that moment, a stripy orange cat leapt from the shadows. Elrac tripped over Grimble, then staggered and fell. The jar flew into the air, turned a somersault and landed with a crash on the stone floor. The crushed Konkipong leaves wafted away with the wind that whooshed through the cave. Sparks spat from Wizzbang’s eyes and a roar resounded around the cave. Elrac lay quaking where he had fallen. His master was very angry indeed. Elrac held his breath, waiting for the answer. Elrac gasped. People who went to the Neverever Mountain neverever came back! I am married with two grown-up children and five grandchildren. I live in West Sussex, an escaped Primary school teacher, and erstwhile college lecturer and Bed and Breakfast landlady! I am a school governor and visit school to read my stories to the children. 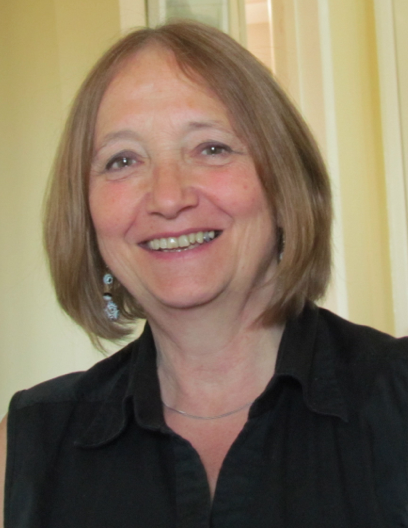 I recently successfully completed my MA Writing for Children at Winchester University. I belong to the Society of Authors, SCBWI and CBC. My first children’s book was published twenty years ago and to date I have had 46 books published (three more due out this year). I have written for many different publishers and my books range from early reading books to teenage novels. I love thinking up new ideas for stories, which often come to me in the middle of the night, and I write almost every day. I enjoy writing to deadlines. I also read a lot - a wide range of books: children’s, YA and adult. I enjoy travelling, mainly to Canada (my daughter and three grandsons live there) and France. I like cats, cooking, speaking French, going to the theatre, classical music, seeing friends and family and walking in the countryside. Did Jasmine Richards, Ben Illis, Amber Caraveo and Karen Ball each choose the same as the children? Look in next Sunday, same time same place, to find out! Fantastic news! Well done Jill - I love your extract, so exciting - I hope Elric makes it back - will we find out? Love this opening - congratulations, Jill! Congratulations, you're extract obviously had all the magic ingredients that the children wished for. Well done! I agree with the children - I want to read more. Well done. Yes many congratulations Jill for an excellent 7- 9 year old opening! Thanks, all - it was a really lovely surprise to have won the children's vote - thanks to the children of Sparsholt and Chew Stoke Schools - after all, you're the important ones - what are we writers for, if not writing for you!! Well done to all the other short-listed folks, especially who got a special mention from the shadow judges.